Undermorph, a creature that dwells deep within ruins and covered mineshafts. Rumors spread far and wide that they are the survivors of the cataclysm that nearly wiped out mankind in Tyrid centuries ago. 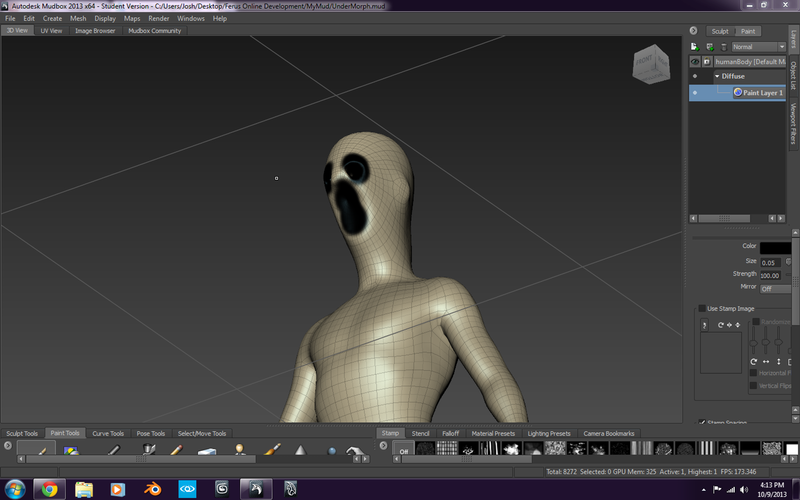 Fully Collisioned and in need of a Texture/Material job. 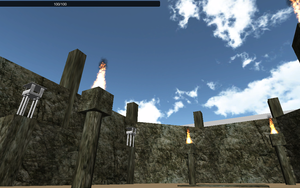 These will be player constructable and serve as defensive positions and territory markers. A collection of Rapiers. Just a few of many customizable and enjoyable weapons that will scatter the lands. Choosing to fight like a gentleman, a savage, an assassin, or what have you, your arsenal can be as varied as you can wish and manage. 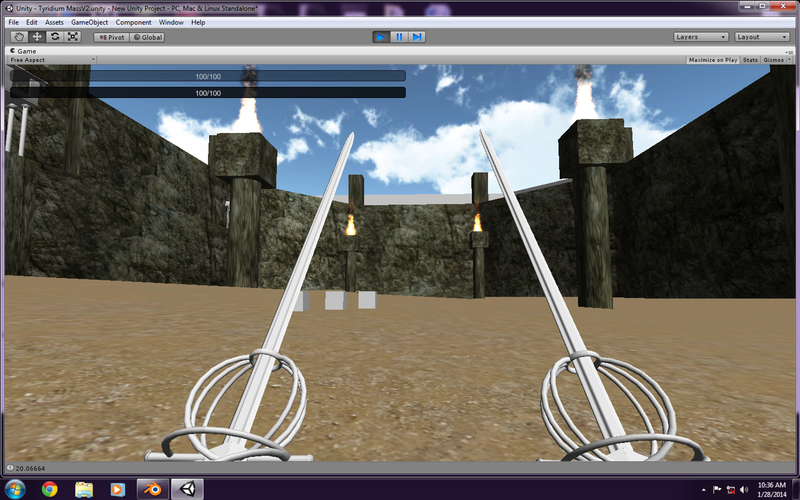 Twin Rapiers of Pre-Alpha Sneak-Peak Release. Closed Multiplayer Testing Soon! 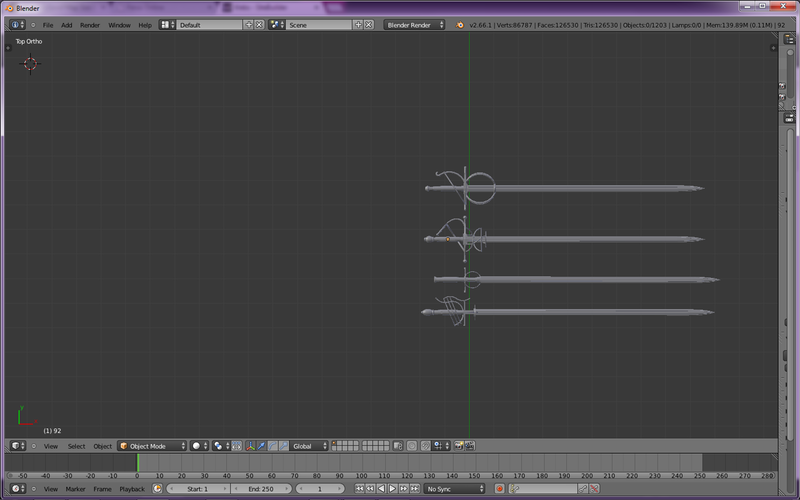 Double Rapier Combat Conceptual for Pre-Alpha Sneak-Peak Release. Register, and be considered for FREE Alpha Testing! Ferus is latin for "wild or untamed". Ferus is pronounced correctly as (fay-roose) but that is not nearly as much fun to say as (fair-us) as we have taken to calling it. Sandbox fantasy medieval-renaissance semi-steam-punk open world pvp and pve full loot goodness. A couple of the key goals behind Ferus Online are creating a virtual environment that gives the player enough options to play their way, no matter what their play style, as well as keeping the sandbox mmo genre alive. Too many MMORPG's today are run of the mill, brain rotting, tab target theme parks where you are immediately introduced with the one thing you can in the game which is run around and complete quests. These Quests are rarely satisfying and more often than not immediately make you out to be the hero of the land. Not only is this boring and rather stale after so many uses by various big time developers, it is an insult to a players intelligence. Do they honestly think everyone isn't going to realize that they're ALL the legendary hero of that town? On top of this it seems every hero of the land has been reduced to a loafer who goes and kills 10 wolves for the farmer in order to make a living. Ferus Online is aimed to make it so players CAN become very important world wide and are likely to be very important within their own group of players. Someone who is well known and considered a hero would have earned that status, by completing something nobody else could, likewise a player could become very notorious throughout the game world through ill actions on a scale big enough to make the entire server shiver or hide for cover when they draw near. In terms of an RPG, the semi-sandbox goal in mind for Ferus Online breathes new life into role-playing. Too many so-called RPG's give you very little options. You MUST be a dragon slayer, or you MUST side with this team. That is nonsense. You should be able to choose your fate. You want to save the world? Go right ahead and try. You want to burn a village to the ground and hear your factions name echoed in terrified whispers? Great it's an option. You want to be a mercenary fighting for whichever side pays better? Also a viable option, just hope your greed doesn't catch up to you. Now you may be wondering "Well what if I don't like killing things?" Well then you can be a farmer, a smith, a jeweler, a fisherman, a lumberjack, whatever it is you see fit to do. Perhaps you will save up money and buy a house or a shack and set up an inn. Maybe still you'll rise to the top and own an empire of luxurious inns throughout the map. In a true RPG like the vision of Ferus Online, it could, and SHOULD happen. Why should players be restrained by the world they all inhabit, when the point of all being able to play together is being able to interact and effect each other? Players in Ferus Online will be able to shape their world and change its policies, wipe out dangerous creatures that pose no benefit, and tame the harsh wilderness. A world where players can build and rule vast cities and countries, as well as wage war on each other over beliefs, grudges, or valuable resources. This world is our dream. Come share it with us. Come Change it with us. This world is for us all, and it it will be realized. Ferus Online is a work-in-progress game that centers on the world of Tyrid. The world of Tyrid is a harsh one, and always has been, but more so than ever for the 100 year span before the time Ferus Online takes place. Tyrid is made up of a central continent and its surrounding islands. Throughout human history in Tyrid, the sole enemy of mankind was other humans, but after thousands of years of fighting, the central continent of Tyrid had been united under the sole banner of the Decretic Kingdom. The new goal of humanity became moving forward technologically. Just as the age of steam was born into the world and industrialization and further progress were soon to follow, something unprecedented shook Tyrid to its core. A disastrous cataclysm tore a massive hole in the center of the continent and the shock wave wiped out eighty percent of the population. Another fifteen percent died in the decade to follow the disaster. Many were killed by the monstrous creatures and magic that entered the world with the cataclysm. Others were killed in the looting and thieving as a mentality of survival of the fittest gripped the masses. The only true city that had withheld against all of the trials was Westrise, a city with massive walls built around a fort founded by a Decretic Commander, Lord Balric,at the end of the last great war, the Decretic destiny campaign. The city had endured constant battering throughout the last great war and had survived the apocalypse itself. A beacon of hope for mankind, Westrise attracted refugees from around the whole of Tyrid, mainland and islands alike. At first, the new coming refugees were welcomed, but as overpopulation occurred because the remaining five percent of the population crowded into a single city, the citizens of Westrise became restless. The City became cramped and unemployment soared. Despite the efforts of three different military governors over the next ninety years before the start of Ferus Online, slums took root and the crime rate grew. As a result, many have set out into the world outside of Westrise, forsaking the protective walls and legions, all with different dreams and ambitions. At the same time many have remained in Westrise, out of fear, pride in the city, or ambition of another kind. 100 years after the apocalypse that wiped out the Decretic Kingdom and a majority of its populace, no one knows for sure what caused the cataclysm in the first place. Due to the fact the blast released magic and fantastical beasts into the world, many blame those who dabbled in the theoretical occult before the apocalypse, and as a result scorn anyone who uses magic. Others see the magic as a new tool which is neutral and can be used for good as well. Some say the disaster was not caused by anyone but was just like any other natural disaster except for far less common. There are even those who blame the losing side to the Decretic Destiny Campaign, and there are those who claim divine powers are at work. There are still those who do not care what caused it at all saying it was 100 years ago and the future is more important now. No matter the reason for the apocalypse, or ones outlook on it, the world will never be as it was, and it is up to the players to grow in power and control and forge a new world. The expansive planned world of Tyrid. The only safe zone to date is the starting tutorial island.. or islands rather as they are somewhat split. 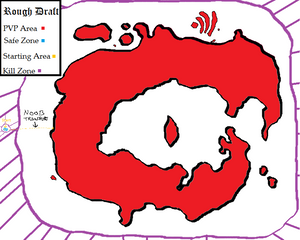 This sea is center map and surrounds the arguably most important place in the entire game world. It also houses the most dangerous creatures as it was cataclysmic flash point. It will likely become a PVP hotspot for sailors and ground fighters alike. Insane amounts of timber and freezing cold surprises lay in store. The archipelago of islands at the top right are known as "The Claws" and could prove very worthwhile to travel to. Assuming you can keep alive. 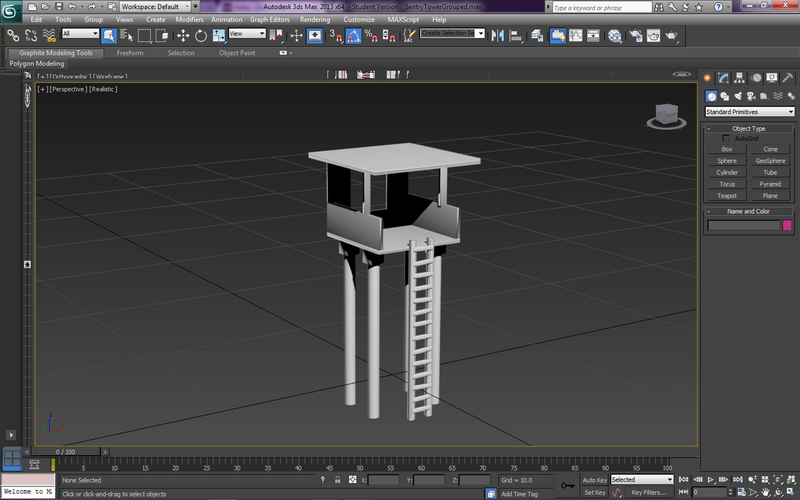 Placeholder arena and overwatch sentry towers currently under development. 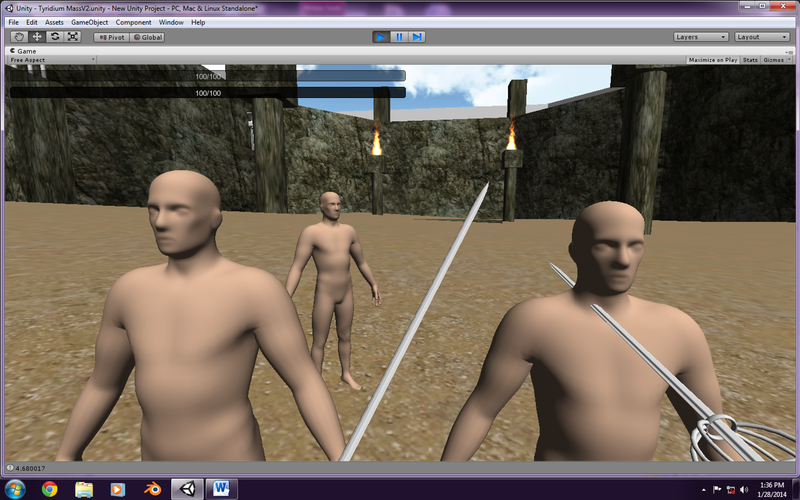 Once the Design is complete it will be filled in, we'll touch up the combat system and test with volunteers. Like what you see here? Want to keep updated or show your support? Like us on Facebook and register an account, here on the website.